Q. What TYPES OF HAIRSTYLES does the Ideas Catalog offer? Q. Can I set a DEFAULT HAIR COLOR for every perm to appear in as I try them on? A. Absolutely! Click the "Hair Color" icon On the left control panel to access the color chart (see images at left) and use this time-saving feature (you could even have your Indie styles come up purple when you click them). You can also switch colors on the fly or revert back to non-default -- and even change highlight colors with the Highlights Chooser (see right). Q. Is it possible to SAVE a finished image so I can retrieve it later? A. Just select "Save to Favs" on the lower right panel. Favorites can be viewed (click the icon on the left panel), added or deleted in seconds, and you can print or share your images as well. 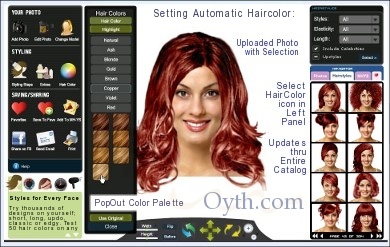 The Auto-Color feature makes it a breeze to preview hair color ideas. Just choose a default hair color from the chart, and the catalog instantly updates every design. It works for all types of styles for both women and men. Reverting to original color for the perm you're testing will also show the original colors of the styles in the gallery. Mouse over any gallery thumbnail to reveal the original photo plus information. Q. What type PICTURE OF MYSELF should I use, and how do I upload my photo to my private gallery? A. Use a head-and-shoulders snapshot, looking directly at the camera, with your hair tied back from your face, and ears uncovered -- this way you can try on any type of hairstyle! Make sure your picture is clear, focused and well-lit. A plain white background works best. To upload: Log into your account and click the "Add Photo" icon in the left panel (jpg format, at least 200 x 250 pixels, and less than 1 Mb). 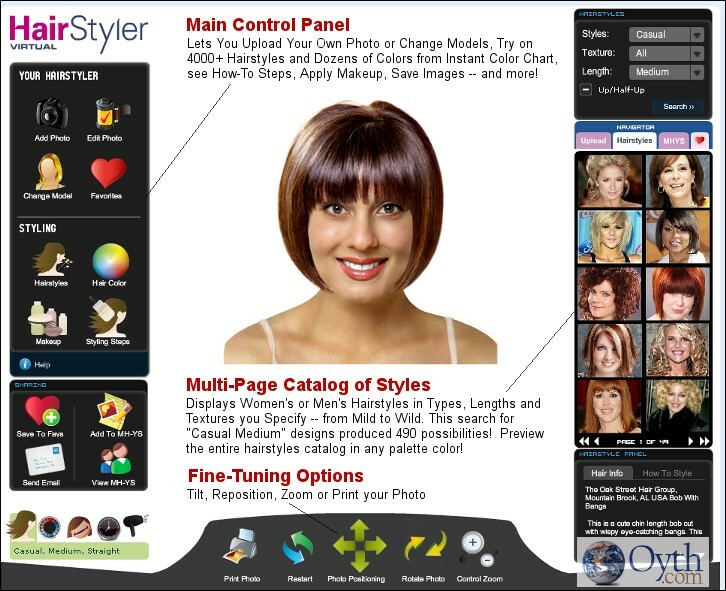 The Hairstyle Ideas Catalog includes a photo editor to optimize your picture; the adjustment controls along the bottom let you fine-tune the positioning if needed. A. Click the "Align" tab on the Makeup panel and use the tracing tools (see image at left). Tracing is not needed for the Foundation and Blush. Q. Can I upload MORE THAN ONE VERSION of my picture? 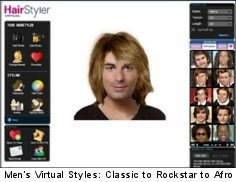 A. Click "Change Models," pick "Male," or upload your own picture. Then click the "Hairstyles" icon, select "Men's Hairstyles," then click "Continue," and choose the textures and lengths you want, click "Show Results" (or use the "Try On" icon in the hairstyles information area, outside the Finder). A. Great new perms of all types are added regularly! Q. What HAIR COLORS in particular does the Catalog offer? A. The Catalog's Hair Color Chart offers dozens of popular hues that wear many names: Blond/Blonde (Platinum, Sandy, etc. ), Brunette/Black, Red (Ruby, Burgundy, Ginger, etc. ), Brown (Caramel, Bronze, Chestnut, Mocha, Hazelnut, etc. ), Violet/Purple, Gray/Grey, Auburn, Copper, Ash, Autumn, Gold/Golden, or White -- in tones ranging from Light to Medium to Dark! A. In the left panel, click "Change Model" and choose female or male (see images at right). And when you upload, remember that you can add multiple versions of your picture! Q. Can the Hairstyle Catalog AUTOMATICALLY find the best hairstyles -- and hair colors -- for my FACE? A. Certainly! Access Wizard mode by clicking "Hair Consultations" -- and in moments, try hairstyles & colors based on your face shape, eye color, skin tone, desired length and other specifics you enter (wear glasses?). For guys, too! There's also options for updo and formal -- the Wizard even matches styles to the formal dress you'll be wearing (spaghetti straps? lace? asymmetrical?...). You can alter the suggestions any way you like! A. Just click the blue "Help" button in the left panel -- there's also a customer service department ready to assist you (most styles also include styling steps for home perms). You'll find that the Hairstyle Ideas Catalog is a breeze to use -- have a ball and get in touch with your inner punk rocker (or chief executive)!